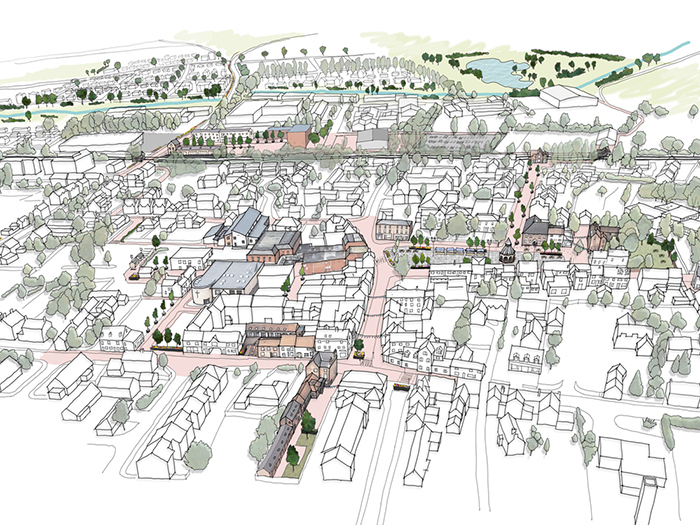 URBED, appointed by Rushcliffe Borough Council in October 2017, have been working on a Town Centre Masterplan for Bingham: an expanding market town in the borough of Rushcliffe, Nottinghamshire. The town currently hosts a population of approximately 9000, whilst proposed housing developments to the north of the settlement could accomodate up to 1050 new dwellings within the next decade. Bingham is conveniently located nine miles east of Nottingham, and lies on the Poacher Line rail service linking Skegness, Grantham and Nottingham. Wedged between the A52 and the A46, the town also facilitates efficient road connections to Leicester and Newark-on-Trent, making it a desirable commuter location. The recent Community Led Plan (2016) reported strong desire to see improvements to cycling facilities and footpaths, in order to create safer connections between Bingham and its neighbouring villages. The town benefits from attractive rural surroundings, set between large arable fields, and only fifteen minutes cycle from the River Trent. 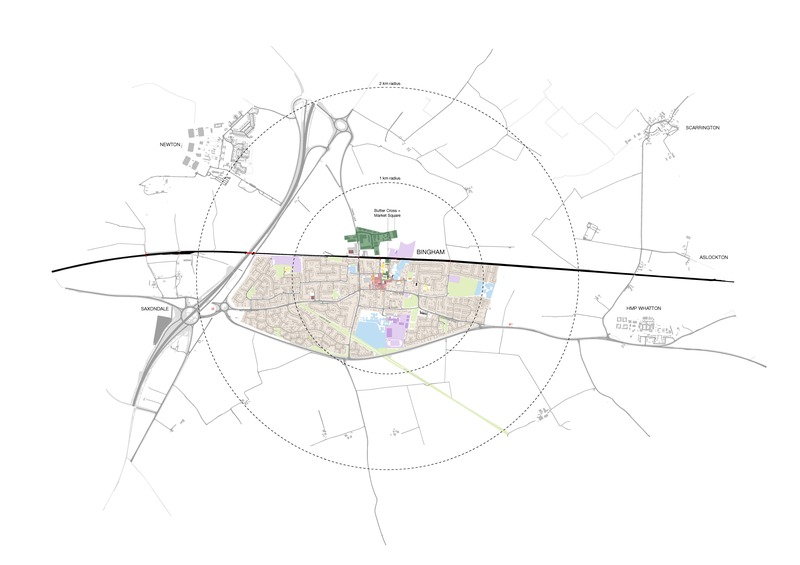 Bingham Town Council (BTC) and Rushcliffe Borough Council (RBC) are keen to ensure the opportunities offered by the northern expansion will be captured fully and integrated into the existing urban framework. 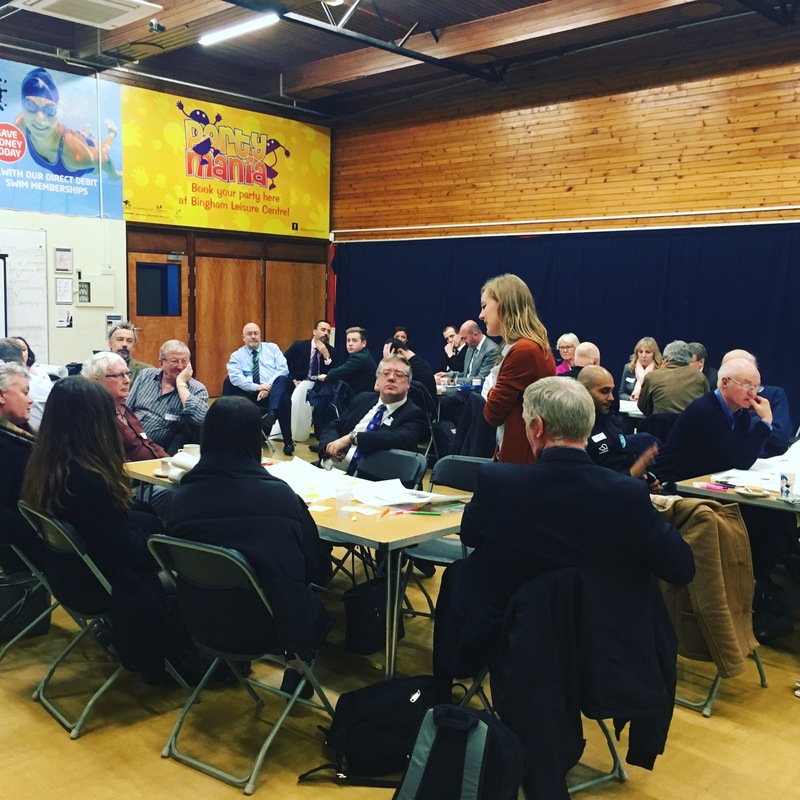 URBED have engaged in a process of community consultation and research based design, suggesting strategies for Bingham to thrive as a local centre - supporting over thirty nearby hamlets and villages - and to become an exemplar for modern town urban extension. URBED have been working together with the Bingham Growth Board and has been supported by ADE Regeneration. Following feedback from the public consultation, URBED evolved the 10 Year Vision Strategy for Bingham, and presented outcomes from the final report to Bingham Growth Board at the end of April 2018. The next stage will be for the board to develop an action plan. We have been incredibly impressed by the keen community spirit in Bingham, and would like to thank all those who inspired us throughout the process. it is vital that residents continue to be included in the developing vision for the town. First and foremost, the aim of the 10 Year Vision is to recognise what is already great about Bingham and maximise upon these many positive attributes: Bingham is prosperous and popular and must retain it’s historic identity. Enabling Bingham to thrive as a Local Centre relies on the strengthening of the central retail district, and the enhancement of sustainable transport links to increase footfall. 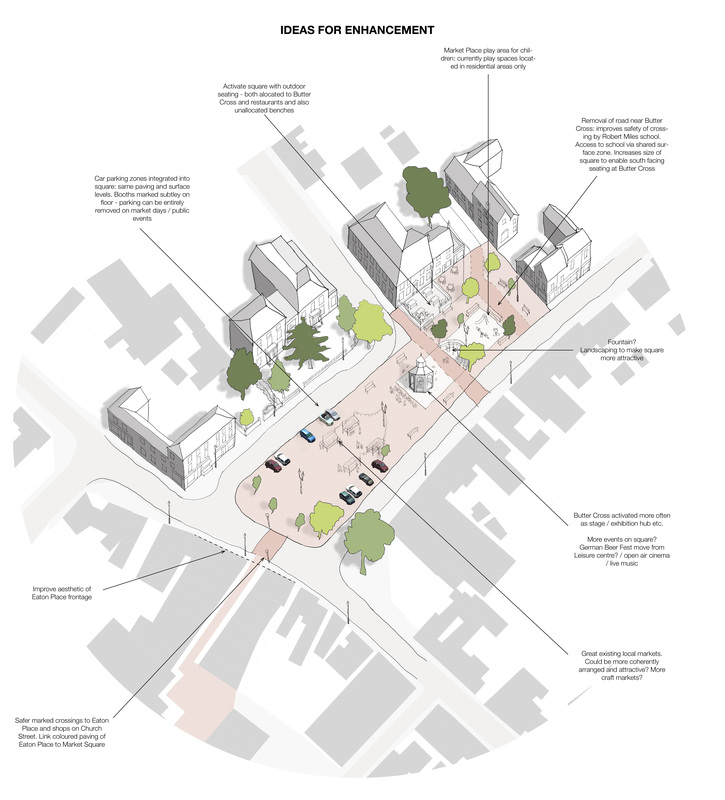 Our masterplan prioritises infrastructural and aesthetic improvements to the town centre, but also recognises the need to look beyond this at the provision of better connected walking and cycling routes, encouraging residents to stroll into the centre, instead of getting into their car and seeking shops and entertainment elsewhere. Community facilities are to be enhanced, with the provision of a designated community centre, and ideas for augmenting activity around the Buttercross. 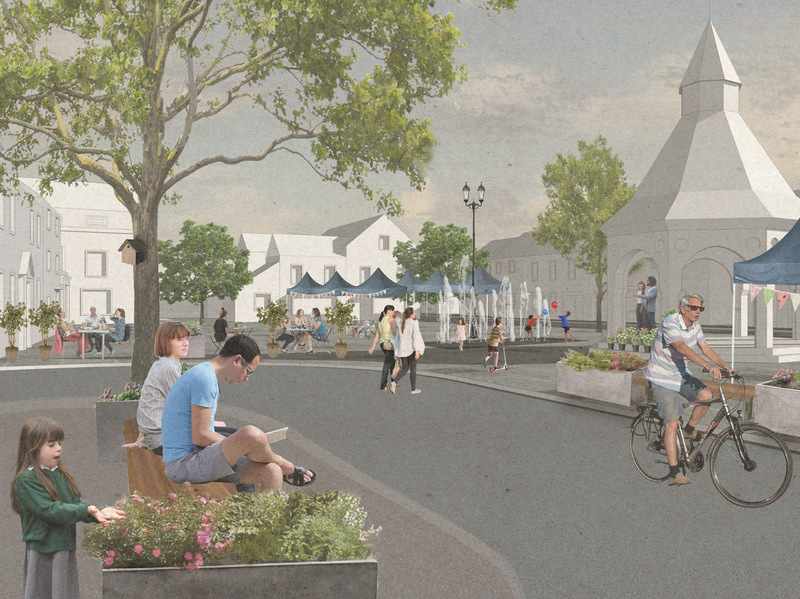 "Most people would like to see this area enhanced as it is the heart & sole of the Town"
"Good pedestrian and cycling routes benefit all, including those pushing prams or wheelchairs and mobility scooters"
Our public consultation is now closed. We have received a great number of questionnaire back, both in paper format as well as from the online version. We will be reviewing the results and undertake an analysis to help inform the progress of the vision masterplan. We will share a summary soon. We were in Bingham today, meeting and talking with local residents about our emerging Town Centre Vision Masterplan. We are very grateful to all the residents who came to see us at Bingham Library, who very kindly hosted us for the day. The public consultation day has now concluded but the presentation boards will be avaiable on display for everyone to see from Monday morning (12th) at Bingham Town Council, on Church Street, for a further week until the 18th of March. We have left blank questionnaire that can be filled in and returned to us via our Freepost address. Residents and community members can simply pop the completed questionnarie in an envelope and just write the following on the front of the envelope: FREEPOST URBED. Members of the Bingham community and residents can also click on the links to the right hand side of this blog post to see and download PDFs of the presentation boards, and then fill in the questionnaire online here. The online questionnaire will close on the 18th of March as well. We look forward to receiving, reading and analysing all feedback received. It will inform the design progress. 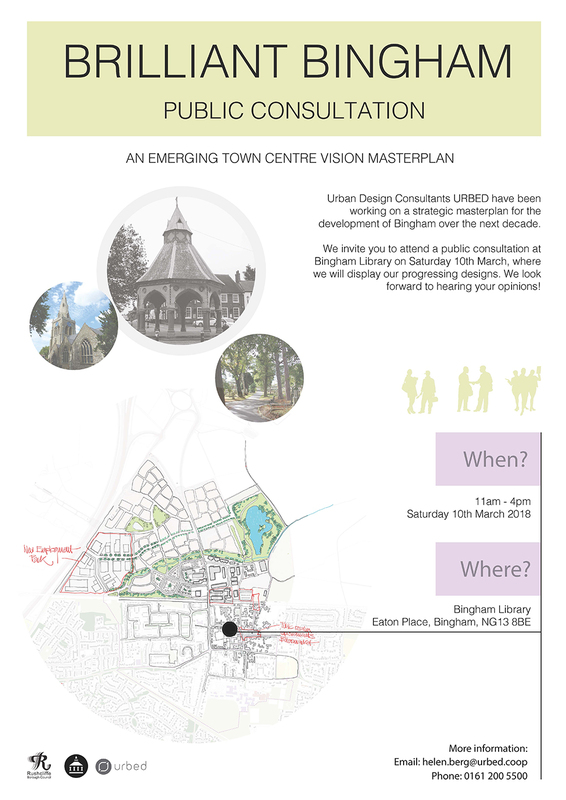 We are preparing our material for the upcoming public consultation on our emerging Bingham Town Centre Vision Masterplan. We look forward to discussing our emerging masterplan and proposed strategy with members of the Bingham community and local residents. We will be at Bingham Library on Saturday the 10th of March from 11am until 4pm. The emerging work will be diplayed on visually engaging boards and we will collect written feedback. The feedback will inform the design progress. After the public event, we will share our boards here online for a further week (until the 18th of March) to offer the possibility to send us further feedback. The boards will also be displayed until the 18th of March at the Bingham Town Council, for people who wish to see the boards in person, it will be possible to leave feedback using the questionnaires or by emailing us at helen@urbed.coop. On 7th December URBED held a participatory workshop exploring the development of Bingham over the next decade. Representatives from local councils and community groups were invited to share their thoughts and opinions regarding priorities areas for our emerging strategic masterplan. There was excellent attendance and enthusiasm at the event, with 40 participants. Attendees were split into five roundtable groups, each with a facilitator from the team. Discussions questioned the participants' existing perception of Bingham, asking attendees to compare the town to other places and assess where Bingham could aspire to become more similar to. A "Vision for Bingham in 10 Years Time" was debated, and concept strategies regarding Bingham's atrractions, amenities, and accessibility were considered. This will assist URBED as we start to create masterplan drawings for the town's future development. In Stage 1, URBED worked alongside HEB surveyors, conducting in-depth baseline analysis. We looked at a number of factors contributing to a 'health check' of the town, including the current attractions, its retail offer, its catchment, and its urban structure – made up by the transport, built and green infrastructure. We also undertook a benchmarking exercise through an analysis of a series of Case Studies of Market Towns and Squares to help draw valuable lessons that can inform the vision for Bingham. Bingham became a chartered market town in 1314. Surrounded by fields, Bingham’s weekly market provided farmers the opportunity to sell their produce, and drew local tradesmen and craftsman. The town gathered at the Market Place for public celebrations, parades and feasts. 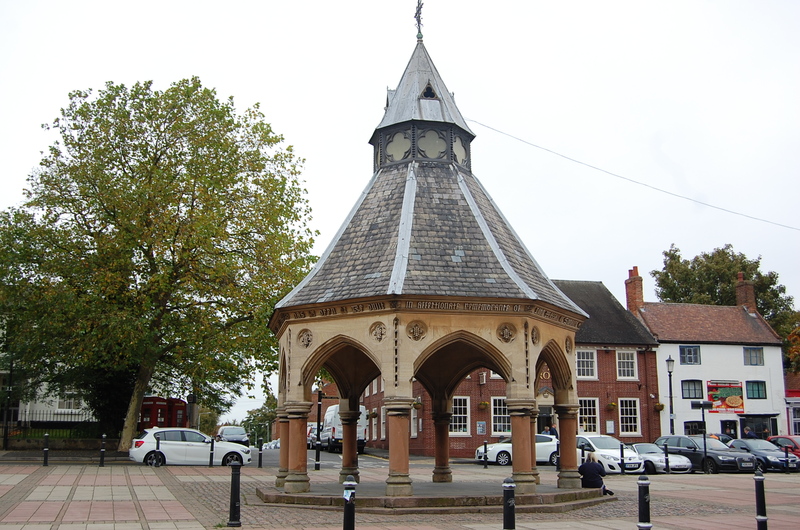 The Butter Cross in the Market Place was the centre of historic Bingham, and still lies at the heart of this modern, prosperous town.